It’s a scenario we can imagine all too well – you are driving and, almost out of nowhere, you find yourself staring into a set of headlights. Just the thought of coming (quite literally) face-to-face with a wrong-way driver is enough to send a shiver of fright down your spine. Perhaps not surprisingly, a large percentage of wrong-way drivers are also alcohol-impaired drivers. The combination can cause serious injuries or even death to innocent travelers. Our Santa Rosa wrong-way driver lawyer advocates for both the injured and the grieving, helping victims recover the compensation they need and deserve. Last week, a judge sentenced a Cloverdale man to five years in prison for a wrong-way drunk driving crash. According to a news release from the District Attorney’s Office, on April 21, 2015, a driver called 911 to report that he’d been forced off Highway 12 in Dunbar by a wrong-way driver. Before police could respond, the wrong-way driver crashed head-on into another vehicle causing someone in the other vehicle to suffer a broken foot. Police reportedly observed objective signs showing that the wrong-way driver was intoxicated and conducted a blood test that found he had a BAC of 0.13 (0.08 is the legal limit). Alcohol-fueled wrong-way crashes are more common than one might imagine, as a quick review of recent news reports reveals. On October 6, a wrong-way driver in Spokane allegedly fled the scene after causing a four-vehicle accident that sent another driver to the hospital in critical condition with swelling of the brain (KREM). In Florida, police say a driver had a blood alcohol level of 0.15 when he allegedly drove the wrong-way on I-95 and crashed into another car killing two sisters, a 24-year-old U.S. Air Force staff sergeant and 23-year-old violinist, on September 26 (Sun Sentinel). Less than a week prior, on September 20, the Atlanta Journal-Constitution reported that police suspected alcohol was a factor in a wrong-way crash that killed the suspect and sent another driver to the hospital with serious injuries. The article noted that the crash was the second wrong-way accident in two days in the Metro Atlanta region and the prior crash had claimed the life of a police officer. Yet another wrong-way crash occurred in Idaho on September 12, with police indicating the wrong-way driver had been drinking prior to the accident that killed a father and his two young daughters (KXLY). The NTSB cites several studies demonstrating the severity of wrong-way accidents. A study conducted here in California found wrong-way accidents had a fatality rate 12 times higher than other accidents on the same set of controlled-access highways. Overall, the NTSB concluded that there are approximately 260 fatal wrong-way accidents each year resulting in approximately 360 deaths annually. 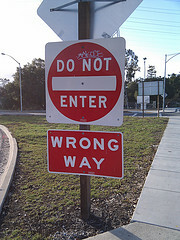 Victims of wrong-way drivers in Northern California are encouraged to call our Santa Rosa car accident injury lawyer. We offer a no-cost consultation where you can meet directly with our experienced injury attorney to discuss your case. Call 800-427-7020 or use the form on this page to contact us electronically.